We have some really exciting news… We can now share Apollo Global’samazing project, Vanta. Apollo are at the forefront of US online and adult education and ‘i-am’ helped them create the Vanta brand and their essence, ‘Changing Lives Through Education’. Vanta works differently to other educational systems. The majority of the work is done online, however students are encouraged to visit the Mexico City or Birmingham learning centres for sessions with their mentors. It was important that ‘i-am’ created a space that was practical, comfortable and inspiring for the Vanta students. Stemming from ‘advatange’, ‘i-am’ developed the name of the project, Vanta. It is a name that works internationally and can be used, registered and understood by a variety of cultures worldwide. Because of the success of the Mexico City and Birmingham sites, Vanta is now looking to expand into emerging markets such as South America, Asia and Africa. 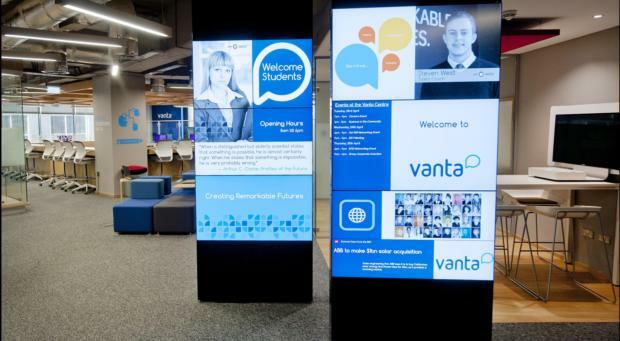 The experience that ‘i-am’ created for the face-to-face learning at Vanta was an incredibly flexible space allowing mentors, students and potential employers to meet in a comfortable and inspiring environment. The state of the art technology implemented allows high quality interaction between students and remote experts. ‘i-am’ developed the feeling of an open space by implementing glass walled meeting rooms, collaboration areas and break out zones all within an open plan layout. The furniture and fittings are comfortable but simple and durable, the colour scheme is understated, but effective and the whole space is geared towards efficient and collaborative learning. ‘i-am’ have been proud to work on Vanta with Apollo. It is an initiative that can change lives and it has been a really exciting journey creating, developing and watching the Vanta brand grow.